This is the storyboard i came up with to design my company sting/ident. The idea behind this storyboard is that something good comes from an initial idea when effort is applied. A first attempt at making a company logo using Adobe After Effects. Tom Geismar is one of the most respected graphic designers, and is responsible for some of the world’s best known company logos. This quote really illustrates the importance of concidering how a company logo would be designed in reletion to the type of company it is to be designed for. Some of Tom Geismar’s most recognizable designs are still in use fifty years later. As part of Craft and Media Technologies Semester Two, we were to initiate the development of a production company logo within our specialist area (mine is Games Design). As the design of games could be considered the first steps of development, I decided to use a name that would re-enforce this idea. 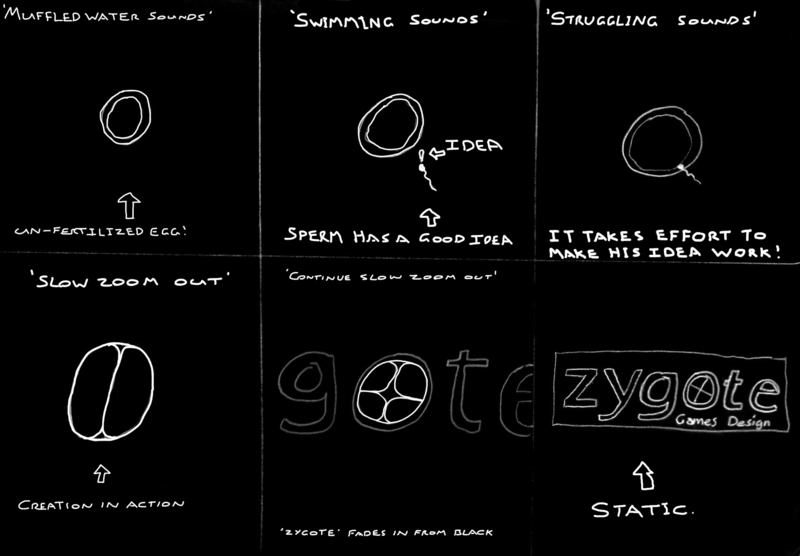 I decided to go with the name Zygote Games Design. Below is my logo design. The name Zygote within a games design company would represent the first stage of development of design, and that this company is the starting point for the design and production of video games. I have chosen a white, bold typeface against a black background purely so that the company name stands out as much as possible. I also incorporated the image of a Zygote within the company name.